(Phys.org) —Scientists working at SLAC, Stanford, Oxford, Berkeley Lab and in Tokyo have discovered a new type of quantum material whose lopsided behavior may lend itself to creating novel electronics. The material is called bismuth tellurochloride, or BiTeCl. 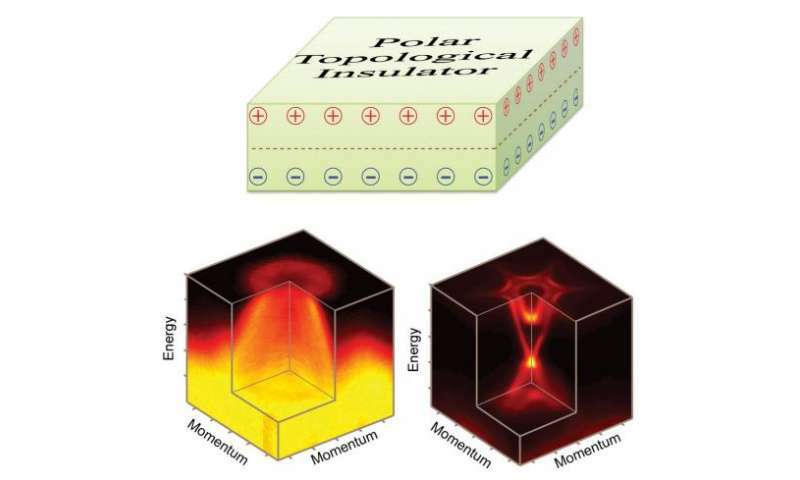 It belongs to a class of materials called topological insulators that conduct electrical current with perfect efficiency on their surfaces, but not through their middles. Researchers hope to exploit their unusual properties to create "spintronic" devices that use the electron's spin, rather than just its charge, to carry energy and information with 100 percent efficiency and at room temperature. In an advance reported Oct. 6 in Nature Physics, a team led by Yulin Chen of the University of Oxford discovered a material made of many layers of BiTeCl and showed that it lacks symmetry in one important respect: Electrical current flows differently along its top surface than along its bottom. In conventional electronic chips, two types of semiconducting materials come together to form transistors and diodes. N-type semiconductors have an excess of electrons and are highly conductive. P-type materials are electron-depleted, leaving positively charged "holes" where the electrons used to be. Where these two types of materials meet in a "p-n junction," electrons flow from the n to the p layer in a robust one-way current. Moreover, this unique type of material can demonstrate many other phenomena. For instance, placing it in a static electric field can induce useful magnetic properties in the material, a phenomenon known as the topological magneto-electric effect, first predicted by theorist Shoucheng Zhang of the Stanford Institute for Materials and Energy Sciences and his group. You could even use an electric charge to induce magnetic monopoles – theorized magnets that have just one pole, north or south, rather than the usual two – and then use this exotic magnetic state to do practical work, such as storing information on a hard drive, Chen said. "This is very bizarre," he said, "because people have never found magnetic monopoles as fundamental particles." For this study, scientists at the Tokyo Institute of Technology crafted BiTeCl from many alternating layers of bismuth, tellurium and chlorine. It was tested in Stanford University laboratories and at two X-ray light sources – SLAC's Stanford Synchrotron Radiation Lightsource and Lawrence Berkeley National Laboratory's Advanced Light Source. Researchers hit samples of the material with an X-ray beam, and then used a technique called ARPES to measure the energy and momentum of electrons the beam kicked out of the material. This gave them a clear picture of the material's electronic state. "The discovery of this new, asymmetric topological insulator will introduce many new phenomena we are looking for, and provide possibilities for device applications," said SLAC and Stanford graduate student Zhongkai Liu, who participated in the experiments. The research team also included Zhi-Xun Shen, a professor at SLAC and Stanford and SLAC's advisor for science and technology; Zahid Hussain, senior staff scientist at Berkeley Lab; and other researchers from SLAC, Stanford, Berkeley Lab and Tokyo Institute of Technology. The study was partially funded by the U.S. Department of Energy's Office of Basic Energy Sciences.